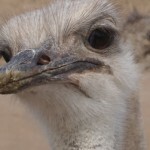 In late July, we visited the Heart of Minnesota Emu Ranch, but when we got a chance to get up close and personal with the world’s largest bird – and a true living dinosaur, we JUMPED at the opportunity. Before the trip, we saw Rooster Cogburn’s Ostrich Ranch on television and decided to stop on our way down to Tucson. And, while we expected it to be pretty cool, we highly underestimated how much fun it would be. We walked up to the open air gift shop and bought two adult tickets, since once again Kimmer’s attempt to scam a “children’s” discount for us failed miserably – I think he’s too tall. For $10, we were each given a cup of green pellets, a token and a plastic cup filled with nectar – the pellets we were told were for the donkeys, deer, goats and ostriches, the token for the ducks and the nectar for the rainbow lorikeets. Immediately upon entering the enclosure we were greeted by a “hee-haw” chorus from the nearby donkey pen featuring one who has become quite famous for her endearingly toothy grin. We spent a little time divvying out, by hand, a pellet or two to each, careful not to re-feed the overzealous. We then waltzed over to the gentle Fallow deer and then sauntered over to the goat enclosure. The first set of goats were perched high above the ground on a scissor lift, and as hard as we tried, we couldn’t get the “food elevator” to effectively transport the pellets to the top. So, we headed over to the “Hole in the Wall Gang” where goats were already poking their heads, their feet and as much of their body through the holes as they could in begging for a treat. They were excitable but maintained a soft enough touch to even give Kimmer a quick kiss. Next was the main attraction – the nine-foot tall giant African ostriches. There are several methods for feeding these large animals depending on your fear-factor. We headed straight to the open tins atop a raised wood railing that places you at eye-level with these unpredictable beasts. 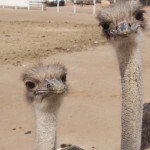 We were initially able to place the food in the container, but once the other ostriches picked up the scent, we had to keep our cups back from the ledge to keep them from pecking them right out of our hands. While they encourage you to simply hold out a flat hand to let the ostrich peck, we value our fingers a bit too much, and with a high-deductible healthcare plan, the prospect of digit reattachment is even less appealing than it normally would be. But, perhaps the coolest animals on the ranch, outside the ostriches, were the lorikeets. As soon as you enter their enclosure, you’re mobbed by hungry rainbow fowl all vying for the container they know you must be carrying. You can’t blame them as their metabolism is so high they need the calorie equivalent of a 150 lb man needing 476 hamburgers just to maintain his weight each day. We have never fed birds like this, but it was more fun than I could’ve imagined – after you get used to holding the birds of course. Once you get an audience you hold the container out, they remove the lid for you and then start feasting. Birds will compete for the food or simply take turns eating. We went back for more nectar as we wanted to do it again. So check out the great video below. This stop was great fun especially for only $5/person – arguably one of the highest price to fun ratio activities we’ve had on the trip. We felt like kids and wanted to feed the animals more but we had to continue down the road to Tucson.